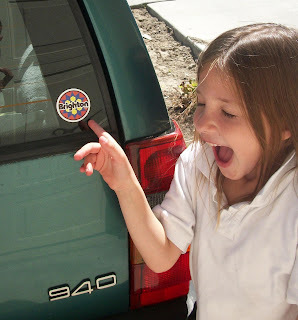 A sticker from Brighton resort, which is her new favorite. We are lucky enough to live within 30 min. from all the major resorts in Utah , but this weekend Brighton became her favorite. I am sure it had something to do with the handful of stickers the lift operator gave her, along with the workers who would cheer for her when she was going down, and the skittles her Papa would give her on the chair lift. She would get one skittle for every turn she did on the previous run. We are lucky enough to have her Papa as a ski teacher for us all.On weekdays he is an engineer, but on every weekend (Nov- May) he is a ski bum. He is so patient with us all and my goal is to have all the kids skiing in the next 4 years (my husband snowboards so that is no help). Normally I say no to stickers on cars, but with this car somehow it is okay. So that is the new, old, addition to our family. 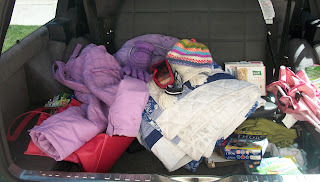 And while my husband prefers to drive his brand new car, this fits the rest of us just fine. 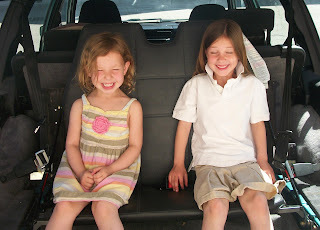 When I was babysitting over the summer, the kids would fight over who got to sit in the jump seats in the Land Rover, because they thought the rear facing seats were too cool! Isn't it funny how much kids love those?! Perfect choice! I have an 2001 V70 I bought used three years ago, and I've been extremely happy with it. It's the first really preppy car I've ever had, although as a single guy with no kids a wagon is probably a little incongruous. Does yours have leather? The only seat that has leather is the 3rd row, which I am a foot too tall to enjoy. It does help with the muddy situations that often end up back there though. You’re right, HillaryPearl! I think all back row seats should have leather covers. It would be ideal for those who have pet dogs, just like me and my family. The seats wouldn’t be as hard to clean if it gets soiled.